Hey, folks! This is a special note (and I send out such notes very rarely from this blog) to let you know of an opportunity for a FREE subscription to a great little devotional magazine. As some of you know, I’ve been working along with my brother Gene for 30 years or so on a little monthly devotional magazine, The Christian Appeal. Gene, our Senior Editor, had been editing the magazine for over 20 years when he asked me to come on board as Managing Editor. So . . . for over 50 years, this little magazine has been going out monthly and blessing, we pray, many folks. We’re very thankful for the ministry of this magazine and all who’ve made it possible (including the churches Gene & I both serve that have made this a part of their ministry as well). For many years, our charge for an annual subscription was $7 (or less). We’ve always been funded primarily by the contributions of a number of generous supporters who believe in what we’re doing. Last year, with the blessing of our Board, we decided to begin offering the magazine for FREE to anyone who requests it. We’re so thankful to the Lord and His generous people for making this possible. So . . . I just thought I’d extend that offer to you! 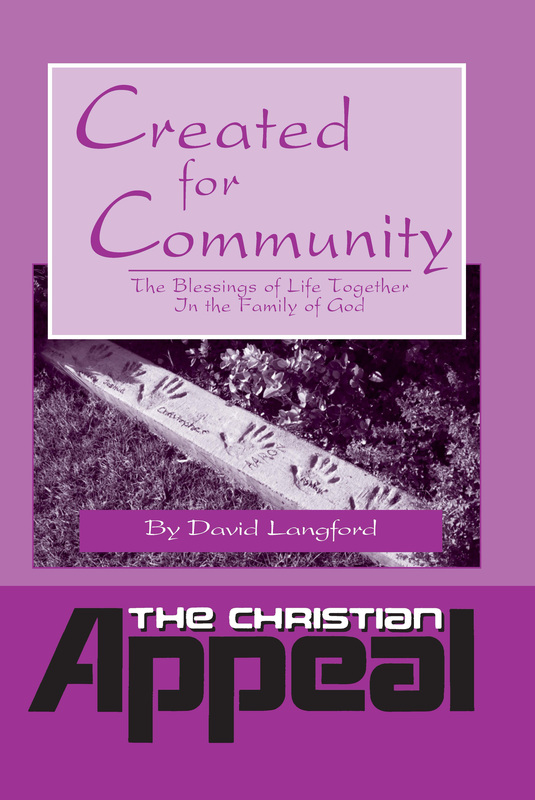 If you’d like a FREE subscription to The Christian Appeal monthly devotional magazine, just e-mail a request to me, including your name and mailing address, at ckshel@aol.com. Seriously (well, seriously, they ARE a great value), I think you’d enjoy the magazine, and we’d love to send it to you. You’ll quickly realize that we do our very best to make the magazine as nonsectarian as possible, something that we hope almost any Christian could pick up and enjoy and feel good about sharing with friends. 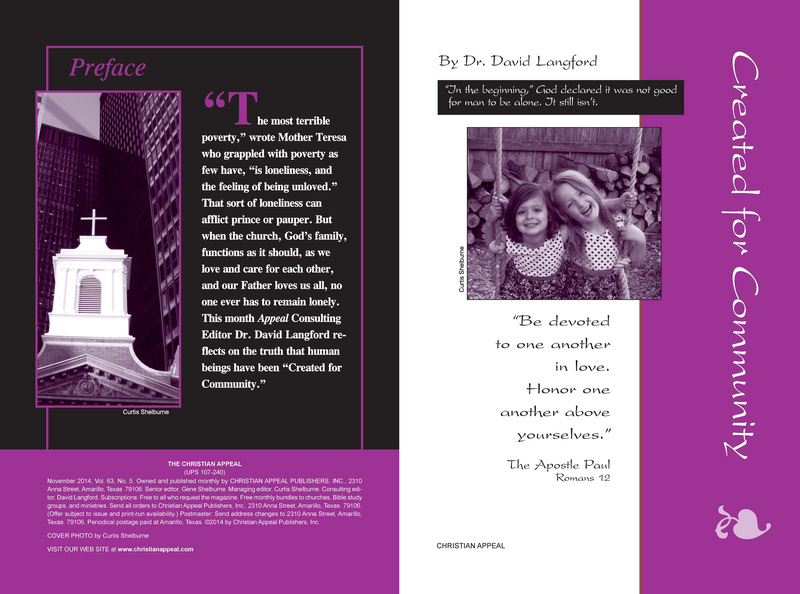 I’ve included a couple of pics of an upcoming issue (our November issue) which will feature a great article by Dr. David Langford as he reminds us of the great blessing of “community” that Christians enjoy as being valued members of God’s family, the church. Jesus wasn’t kidding when he said that Christians have many, many, fathers, mothers, brothers, sisters, sons, and daughters! This might be a particularly good issue to share with your own church family! And the subscriptions are now free! Just drop me a note if you’d like one. Note: No attorney friends told us to put “lawyer litter” here, but I probably ought to say that this offer is, of course, subject to print run and supply availability. We probably can’t handle 50,000 requests. But I’ll be very surprised if we can’t handle yours! (And if you like it, e-mail me about your church, small group, or Sunday School class perhaps receiving a free bundle to pass around to members.) Blessings to you! This entry was posted on Tuesday, September 23rd, 2014 at 2:36 pm	and posted in Uncategorized. You can follow any responses to this entry through the RSS 2.0 feed.